I was at the opening for the exhibition of work by Joachim Koester but decided, on balance, that the subjects shown in his series of images are not close enough to the city or to architecture and design in Denmark to be relevant for a review here but going back recently, to spend more time in the exhibition on a quieter day, I realise I was wrong. It is not the subject of the photographs, although those are interesting, but it is about ways of seeing - about having a viewpoint - and it's about the selection of that view point, the artist editing the scene, to create or, at least, to hint at or imply a narrative, that is an important lesson. Koester was born in Copenhagen in 1962 and studied at the Schools of Visual Arts at The Royal Danish Academy of Fine Arts and he works now with photography, sound and video. The American artist Ed Ruscha documented a number of empty plots in 1970 and collected them in a book Real Estate Opportunities. Koester recorded some of the same plots in his work Occupied Plots, Abandoned Futures Twelve (Former) Real Estate Opportunities 2007. These are “enigmatic images of abandoned places with stories that reveal incredible pasts” and generally record desolation and waste. Apart from the photographs from Calcutta, there are rarely people in the images. Particularly in the American photographs, Koester takes his photographs straight on to the façade, and with parallax removed, and sharp detail across the image, he removes or flattens the sense of perspective or distance so the buildings become specimens to be examined closely and, with boarded up windows and empty yards, the photographs expose decline and abandonment that has taken place over years or over decades. Some of the photographs are selenium toned silver gelatine prints that have deep rich tones of warm greys and that also creates a curious sense of detachment in a world where now it seems anyone and everyone takes so many colour photos. Many of the buildings are boarded up - most look unoccupied - so, above all, the photographs record waste … how humans construct buildings that are extravagant, are expressions of wealth or of optimism or both but they are abandoned and history or events leave them stranded. * a recent article in The Guardian included the astounding statistic that the British shipping company P&O transported 632,000 tons of opium from Bengal to China. We had fairly heavy snow today that settled and, on days like this, people tend to stay in so there is less traffic, certainly fewer bikes, and sounds are muffled. It's a good time to take photographs of the city and not just because it makes a pretty picture. If the cloud lifts, and the sun comes out in a clear sky, it's different because then the colours seem more intense and deeper with light reflected up off the snow but when snow is falling, colours are muted to greys and soft mauves and then what you see is a simplification of the solid blocks with strong lines and edges emerging and it is the underlying geometry of the streetscape that survives … the blocks and the mass of the city. The view from my desk …. 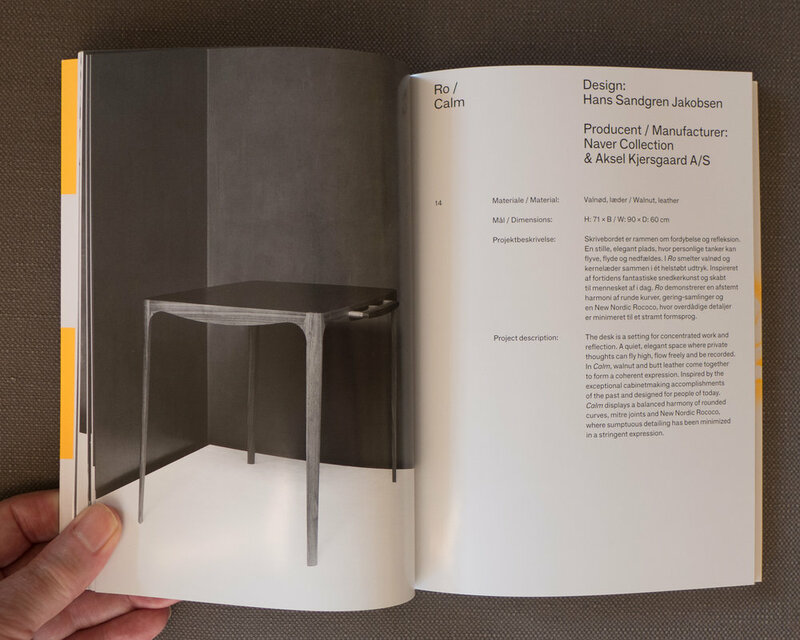 Following a competition by the association of architects, this exhibition shows the five winning portfolios, each with five photographs of a building or a single architectural project. In a World that seems to be dominated by superficial Instagram images this is an important exhibition because instead of a quick glance and a swipe right the photographs are presented for careful consideration. It is difficult to capture, for the record, the qualities and the character of a building in a few images and one function of these photographs is to slow down the process of looking. These photographs are about trying to record what is essential about the style and the form and the materials and the setting of a building. 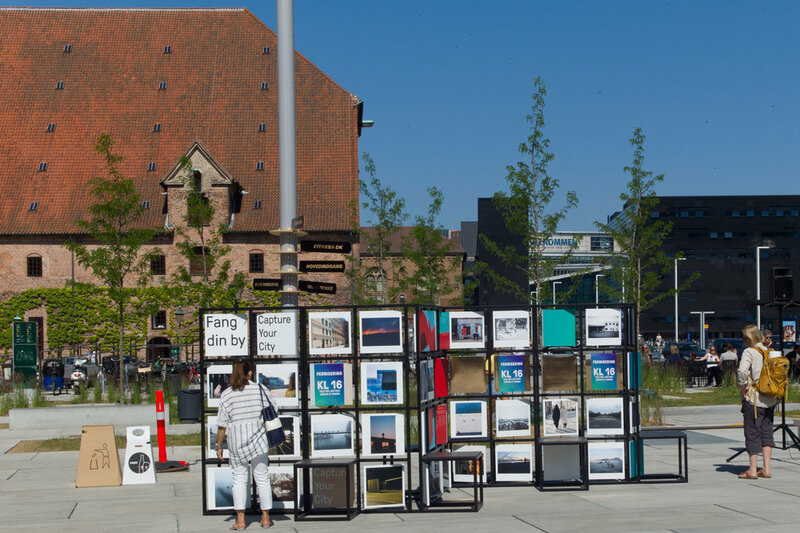 Today - 8th June - an exhibition of photographs of Copenhagen opened on the square in front of the new Danish Architecture Centre. This is the annual show of photographs of the city that were taken for an open competition that this year had 2,600 entries. As part of the Copenhagen Photo Festival, there is a pop-up exhibition in a shop in Købmagergade. 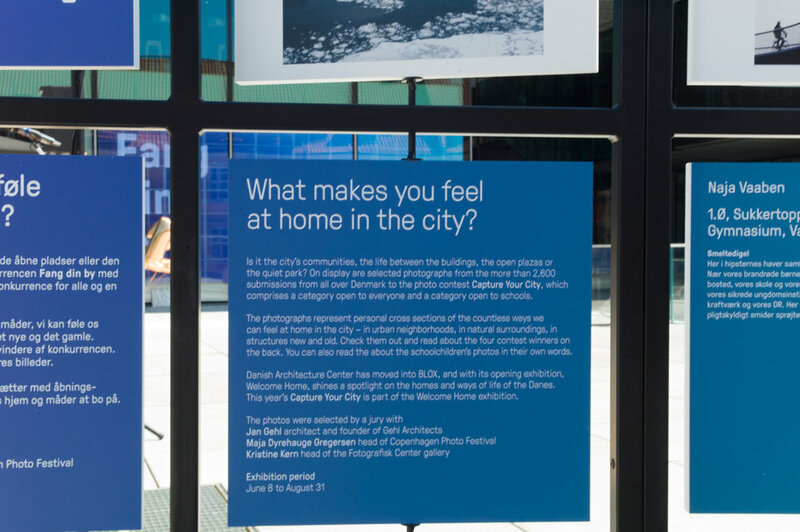 It must be between tenants but this is an appropriate location for the show as there are several photographs of this main city-centre shopping street in the exhibition. 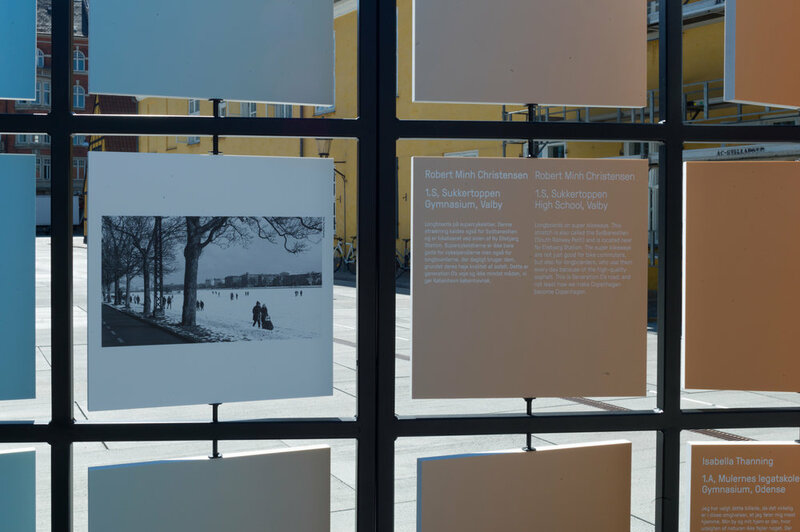 The idea is simple but interesting: a series of street views, taken in Copenhagen by Jens Nielsen in 1968, are shown alongside photographs of exactly the same views taken by Isabel and Peter Aagaard fifty years later. All the photographs - both those taken in 1968 and the recent photographs - are in black and white and shows that colour in photographs can be a distraction. Of course, through the 20th century, black-and-white photography was the stock choice for photo journalism and was used by photographers wanting to examine aspects of society … frequently recording aspects of day-to-day life that reflected wealth or lack of wealth in a society. Most of the photographs shown were taken within the central historic core of the city and it is actually heartening to see just how little has changed over fifty years. A few of the buildings have had inappropriate frontages added for new shop windows or for corporate logos and signage but many many more have been improved because cheap and crude shop fronts dating from the mid 20th century have been removed and more appropriate shop fronts and signs put up. It shows a broad and growing respect for the quality of the architectural details of the old buildings although some would argue that this is creeping gentrification or conservation pandering to the middle classes and the tourists who want pretty pretty rather than anything that is rationally commercial. Of course that period around 1968 was one of significant political protests and contention across Europe but that is not reflected in the earlier views here. It is the small and odd details recorded in the photos that is interesting. Some streets were already being pedestrianised but most had narrow pavements with people restricted to walking along hard against the shop fronts and there was relatively heavy traffic that was dealing with narrow streets and cars parked on either side. There are even photographs that show tram tracks surviving in some of the streets. Just how close did the city get to planners sweeping all this away for bright new shopping malls and multi-storey car parks? In fact only one pair of photographs - taken looking along Landenmærket and looking towards the Round Tower - show that a complete block of historic, timber-framed buildings here was demolished sometime after 1968. This is an important exhibition that shows how much more prosperous Copenhagen is now, fifty years on, and how pleasant the main streets are without vehicles but also without the major city-centre redevelopment that afflicted so many historic towns and cities. 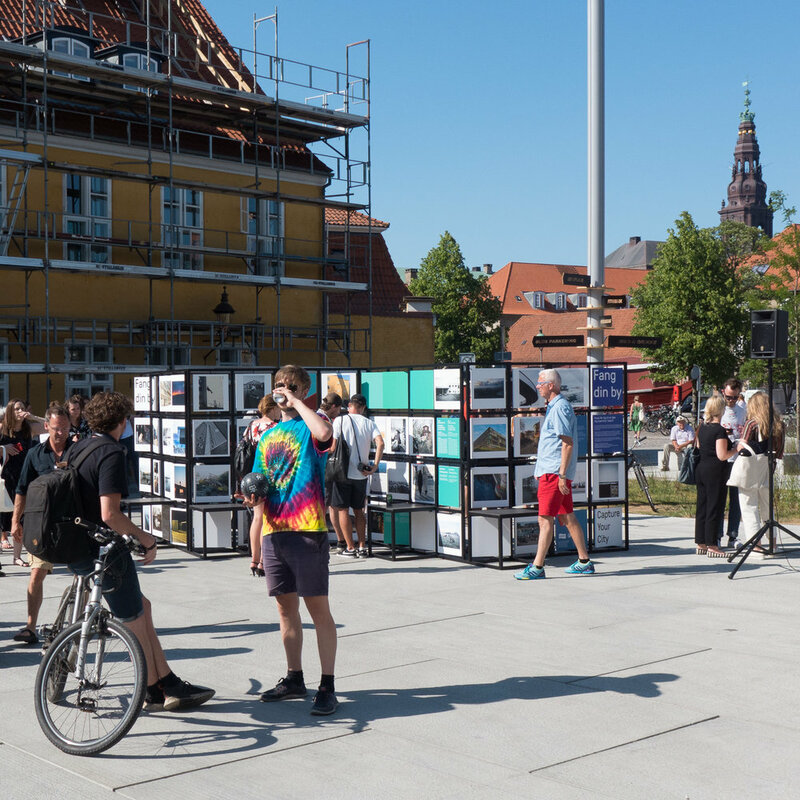 Developers would argue that conservation stifles prosperity (by which they mean generally profit) and inhibits or restricts giving people the modern services and facilities they ‘want’ but looking at these photographs, that would be a difficult argument to win in Copenhagen. Copenhagen Photo Festival opens on 7th June and the programme of events continues through until 17th June. 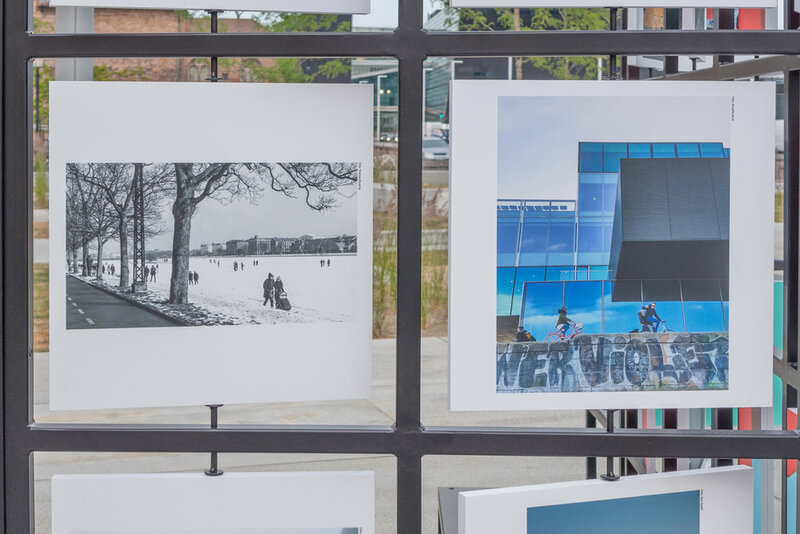 The exhibition has been curated by Marie Stender and is a selection of striking images by different photographers who explore the city as a place for people that is moulded and adapted by people for the way they really live day by day. Divided into three areas - Boundaries, Meetings and Flows - this is the antidote to all those perfect images that are seen in so many architectural journals and glossy coffee-table books were perfect buildings are shown in the best light, from the most flattering angle and invariably devoid of people ... stripped of their reason and, metaphorically and literally, stripped of their humanity. When you watch people en masse in complex urban spaces you see quickly if the planning has failed - so anything from a curiously empty and unused and unloved space to exactly the opposite where a street or a square or a building seems to be overwhelmed by the people passing through or trying to use the space. In these photographs, you see how people colonise public space and use it in ways no architect or planner had envisioned.